Its the end of August and the Mini Farm is in transition. 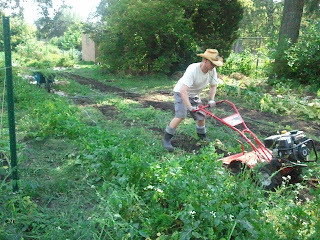 The summer crops are starting to succumb to diseases and therefore diminish in productivity. Teh biggest disease problem right now is powdery mildew, a generic term that describs a variety of fungal diseases common to many vegetables. You know you've got powdery mildew when you see white or grey powdery stuff on the tops of leaves; it starts as sploches on the leaves and eventually covers them completely. Powdery mildew usually doesn't kill plants, but it weakens them and stops them from making nice looking fruits. 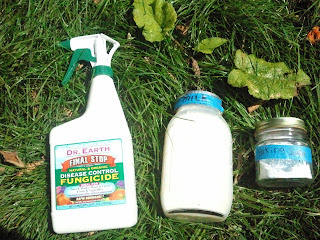 I researched organic options for treating powdery mildew, but the general consensus is that once you'v e got it, you can't really get rid of it and most organic treatments are more preventative than treatment. But, I've got customers and CSAers who I've got to feed, so I've gotta try something to keep the squash and cukes going, right? 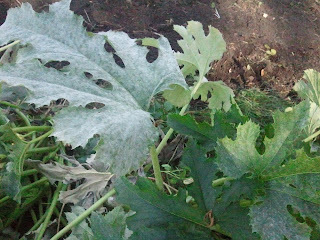 Here's what powdery mildew looks like on squash leaves. So, I tried three treatments, one is an organic fungicide produce and the other two are home remidies, one made with baking soda (1 teaspoon per 1 quart of water) and one made with milk (1 part milk to 9 parts water). Honestly I don't know if any of these will work, but I treated everything yesterday and so now time will tell. 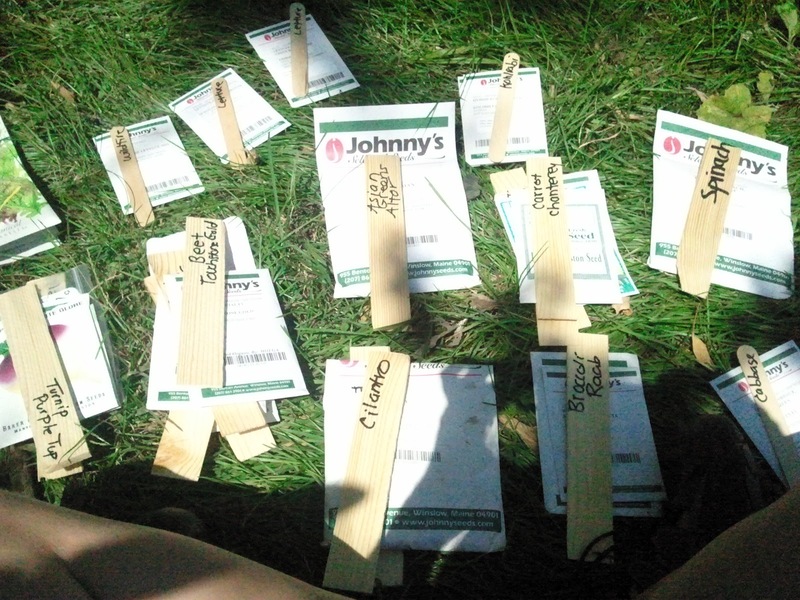 Besides trying to keep the summer crops going a little bit longer, its also the time to plant seeds for fall crops. Over the weekend #1 Gardener's Helper tilled under some weeds and spent crops to make room for new cool season plantings. Yesterday I seeded lettuce, spinach, carrots, turnips, beets, kohlrabi, chervil, cilantro and radishes. Most of these crops grow quickly, maturing in as soon as 20 days (baby spinach and lettuce) and as long as 50 to 60 days (carrots, beats and turnips). I've also decided to plant some small trays of micro greens--mostly herbs--which will also add some variation to the CSA boxes. I'll be planting thai basil, regular basil, red shiso, and cilantro to start with. The idea with micro greens is, you plant seeds very densely and you cut and use the herbs when they are very young, generally when they only have two true leaves. So, that's the update! Sorry for the lack of update since July, but when things get real busy I tend to forget about blogging. That's why I'm a farmer and not a blogger, I suppose. Thanks for reading everyone!